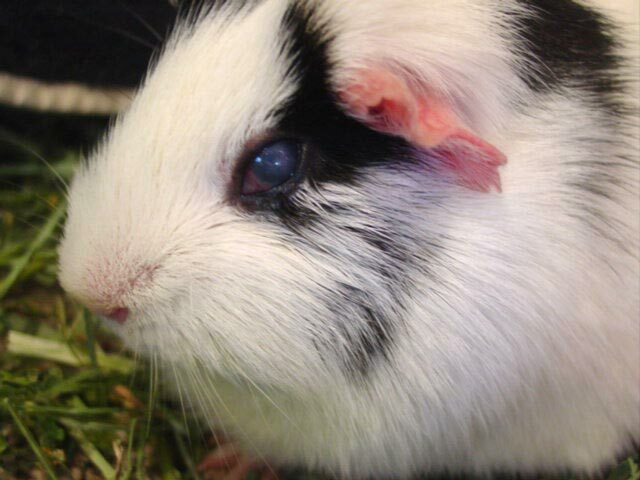 Yesterday, noticed Thelma, one of the Monterey rescues, looked like she was starting to develop a cataract. All of sudden today, the entire eye is cloudy. My vet is out to lunch, back in 45 minutes. Okay, I&acute;m now convinced I have a diabetic pig. Other symptoms present. Forgive me if I sound slow, but don&acute;t cataracts affect the lenses only? So, the entire eye would not be affected? I suspect it is possibly an eye infection of some sort (could be associated with a scratched cornea or not). Glaucoma? KCS? Sorry, but those sound more plausible given the generalized area. Eyes in my opinion are not something to mess around with, but they can be amazingly forgiving and heal well. 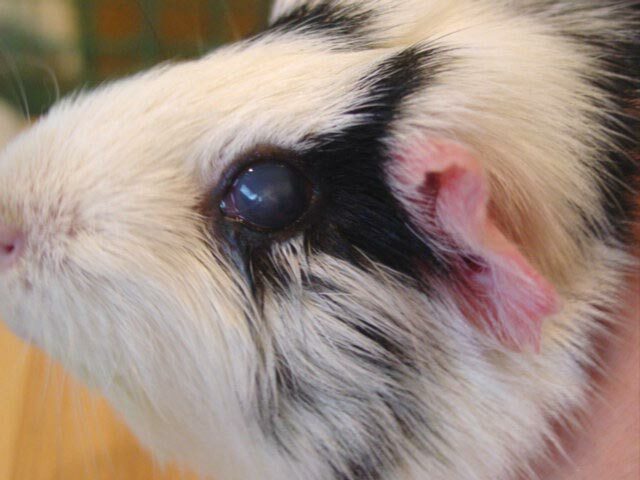 See what the vet says and go from there, but cataracts aren&acute;t the first thing to come to mind. If she has other signs, she might have other things going on also. Infections also involve the cornea, not the lens. Saw your pic at acmepet. You should post it here too. Doesn&acute;t look like a cataract to me. Looks more like a corneal abrasion. Chloralean, Gentocin are effective for abrasions. The vet can do a stain to confirm. Abrasions to the surface of the eye are common and usually caused by hay poking them. The eye clouds over extremely fast. It DOES look like a corneal abrasion and/or primary or secondary eye infection. She even has scleral involvement which is consistent with irritation, not lens obstruction (cataracts). It doesn&acute;t appear as if the lens is involved at all. The vet should stain it with fluorescein stain and check it for an ulcer. Steroid preparations should never be used if there is ulceration. If you have a BNP (bacitracin-neomycin-polymyxin) OPHTHALMIC preparation, that may be used in the interim (before you see the vet). You should see dramatic results with that antibiotic, if it is an abrasion or infection, within 12-24 hours. There could also be a foreign body tucked in the lids also. If the above doesn&acute;t work or produce results, your vet may want to do a more thorough ophthalmic exam for another problem, such as KCS or glaucoma. Last edited by Josephine on Mon Feb 18, 2002 12:19 am, edited 1 time in total. Gentocin(ophthalmic solution) is okay. Gentocin Durafilm IS NOT. The Durafilm(sp?) means it&acute;s a steroid preparation. Right. I&acute;m sorry I didn&acute;t make that clear. It is also personal preference and experience that leads me to go directly to BNP. I (as well as many vets) think it is the standard for safe and effective eye treatment. Gentocin (with or without steroids), while also useful, has its own side effects and indications. I tend not to use it unless there isn&acute;t anything else that will work. It got pulled off of the market here in the U.S. I&acute;m not sure we can even buy it for veterinary use right now or ever again. I think it went the way of the dinosaurs! Last edited by Josephine on Mon Feb 18, 2002 12:38 am, edited 1 time in total. Okay, I have Vetropolycin (bacitracin-neomycin-polymyxin, vet opthalmic ointment) - YUP. So, exactly how much to apply where? I don&acute;t see an exp date, but I know I&acute;ve had it for a while. The Gentocin I have is what I used with my nebulizer. It just says Gentocin, definitely not an opthalmic solution. Sorry for the larger pictures, but I wanted to get the eye detail over the net. Last edited by Teresa on Mon Feb 18, 2002 12:43 am, edited 1 time in total. Yes, it was just the ophthalmic Gentocin that they were REALLY concerned about. The injectible and systemic forms are still available in some places. I think it costs a bit also. It&acute;s like the chlorhexiderm incident. The manufacturers pulled all of the otic products with chlorhex since it was found to cause ear problems. You can still get plain chlorhex, but none of it is labeled for usage in the ears! Yeah go ahead and use the BNP eye ointment. Use a bit on the upper or lower lid and shut the eye to spread it over the entire cornea. You might want to use a sterile saline eyewash in case there is debris that could be rinsed out before applying the ointment. It appears as if there is some vascularization already (eye trying to heal itself), but I&acute;m not sure due to the pictures. The last one looks like there is something in the lower lid perhaps? Does anyone else see it? Ah, maybe it is just the dark pigment of the eyelid. I&acute;m curious as to what it will look like tomorrow after treatment. Last edited by Josephine on Mon Feb 18, 2002 12:58 am, edited 1 time in total. Okay. Will do. Photos tomorrow. Thanks all. No prob getting Gentocin in Canada. Also have used Cipro eye drops. I haven&acute;t had much success with BNP. My favourite, although pricy, is Chloralean(eye version of Chloramphenicol). But you have to watch it doesn&acute;t come in contact with your skin. It&acute;s very weird the difference of med availability. 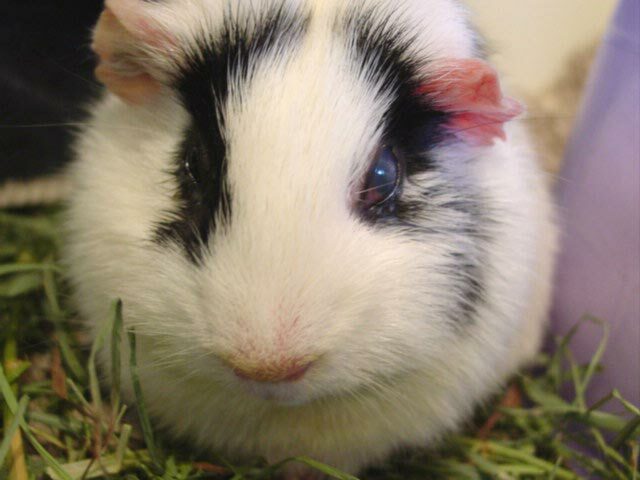 I have a pig on Metacam which isn&acute;t available in the States for animals. The upper rim of her eye was very red. Yeah, definitely looks that way now. At least, now, it&acute;s clear to me. Well, it looks slightly better than late last night, but not better than these photos. So, I won&acute;t take photos right now. Should be back from the vet in a few hours. Treated quickly with the right meds these things usually come out fine. You should see improvements within a day. On really bad eye injuries we&acute;ve had to get up at night to give eye drops every 2 hours. Haven&acute;t lost an eye yet. The vet was also concerned that I didn&acute;t use anything with steriods or cortizone, so I&acute;m guessing this ointment is okay.